Every summer since I've been with Jamie, we've driven up to North Dakota in June to visit his parents in his hometown. And every visit, his mom bakes a rhubarb pie with rhubarb grown in their own garden. I remember his mom saying that she doesn't even like rhubarb pie, but she always makes it since Jamie loves it so much. With our wedding coming up in less than three months, we didn't plan on making the trip up north this June, and since Jamie's always asking me for rhubarb pie, I finally baked one for his birthday dinner last week. The filling was so nicely tart and spiced with cinnamon, nutmeg and cloves, the perfect balance of sweet and tart. 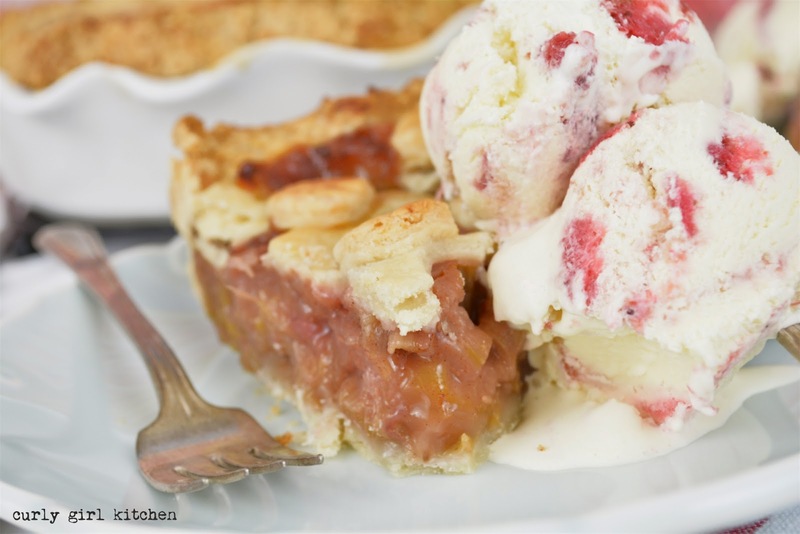 After our dinner of rack of lamb with whipped roasted garlic potatoes and mushroom gravy, we ate pie with the last bit of strawberry rhubarb ice cream I made a few weeks ago. 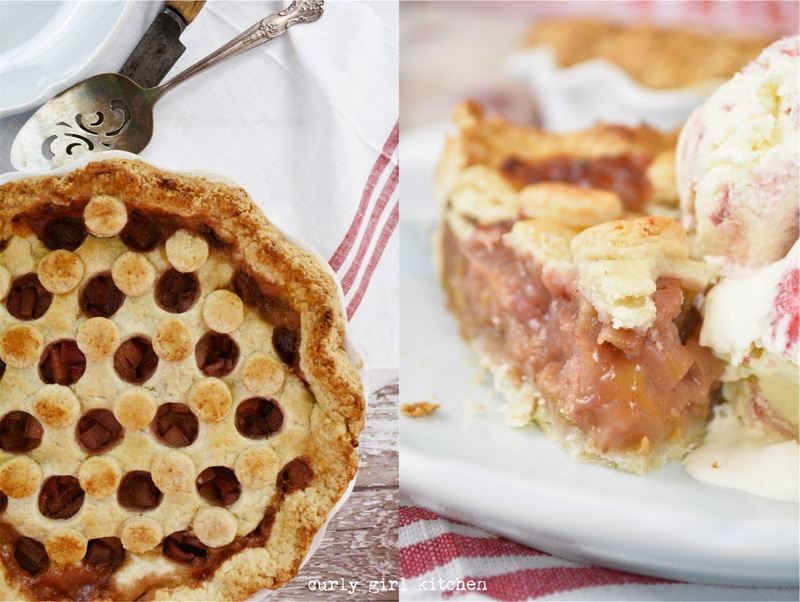 I like trying to come up with ways to make prettier pies, since there's only so many ways you can decorate a pie, unlike a cake where the possibilities are endless. I'm calling this design a polka dot crust, and it's sort of a modern spin on a traditional lattice crust. The polka dot holes could be as small or as big as you like - I used the wide end of a piping tip to cut mine. Late afternoon and evening storms of hail, rain and lightning are typical this time of year in Colorado, and last night we had another such storm that lasted well into the night. Jamie fell asleep on the couch after dinner and slept through the beginning of the storm, so I woke him up to come to bed. I opened the bedroom window a few inches, enjoying the fresh air and the scent of the rain. As I watched the lightning brighten the night sky and the rain stream down the window, a raindrop leaped through the window and kissed my lips. But this morning, the air was balmy and the grass barely damp from last night's storm. 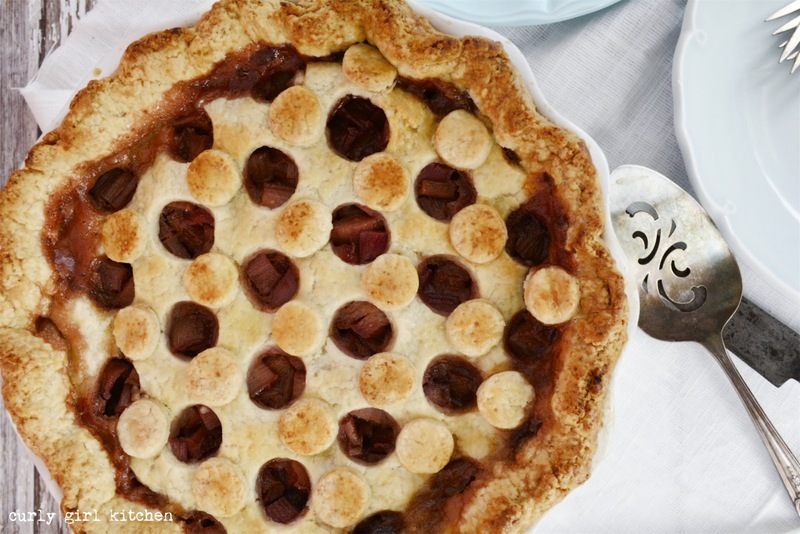 Preheat the oven to 450, line a baking sheet with foil and place a deep-dish pie pan on the baking sheet. 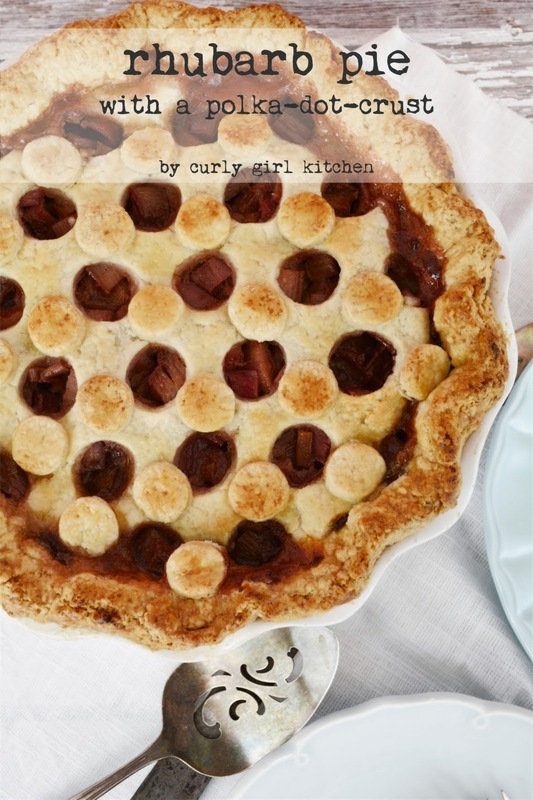 In a large bowl, toss the rhubarb with the sugars, spices, 4 tablespoons flour and the corn starch until evenly coated. Set aside. On a floured surface, roll out each portion to approximately 1/4 inch thick. Place one sheet of dough into the pie pan, letting the excess hang over the edge. 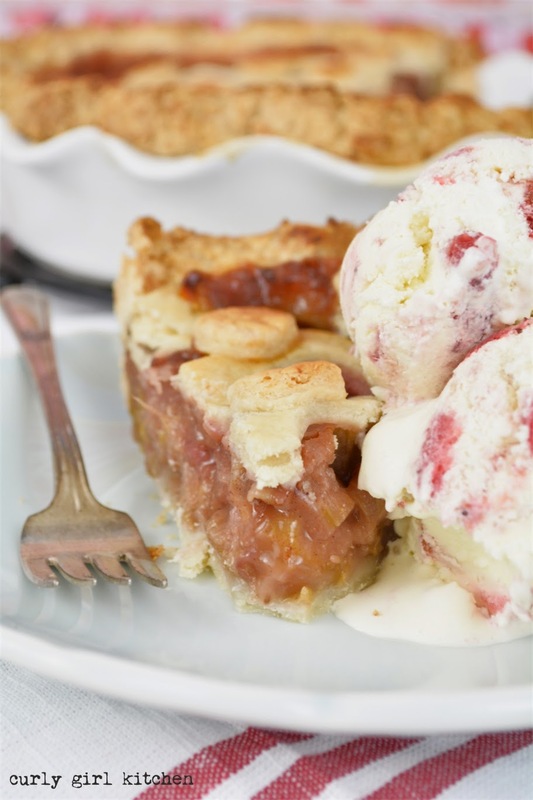 Sprinkle the bottom of the crust with the remaining tablespoon of flour and pour the rhubarb filling in. 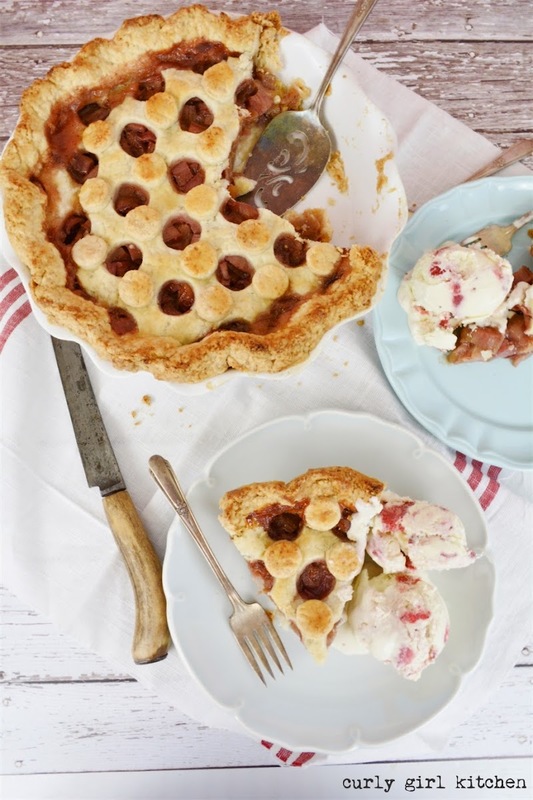 To make the polka-dot-crust, use a small round cutter to cut circles from the top crust; save the cut circles to garnish the top of the pie. Place the polka-dot-crust over the filling and use a little water to seal the edges of the two crusts together. In a small bowl, whisk together the egg and 1 tablespoon of water and brush over the crust. 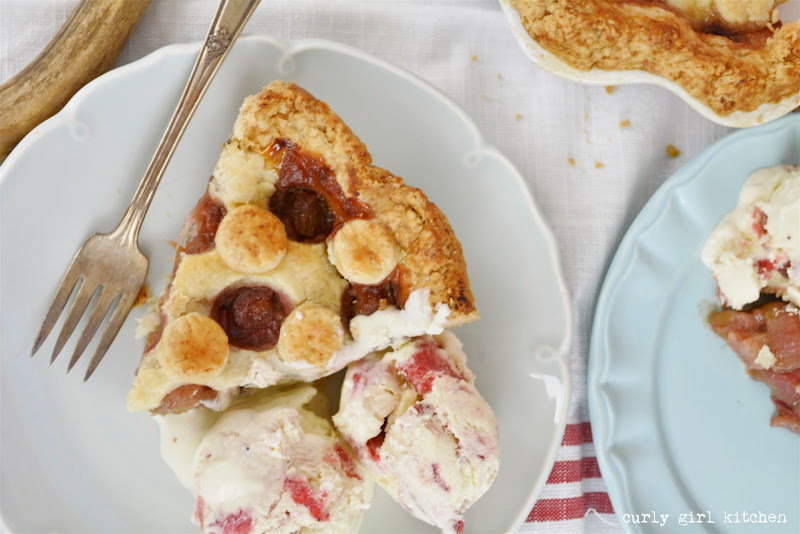 Place the pie on the foil-lined baking sheet. Bake at 450 for 20 minutes, then reduce the temperature to 350 and bake for another 45-60 minutes, or until the filling is bubbling and thick. Cover the pie with foil, if needed, to prevent over-browning. Cool pie completely (uncovered) on a wire rack (overnight cooling is preferable to let the juices set) before cutting. 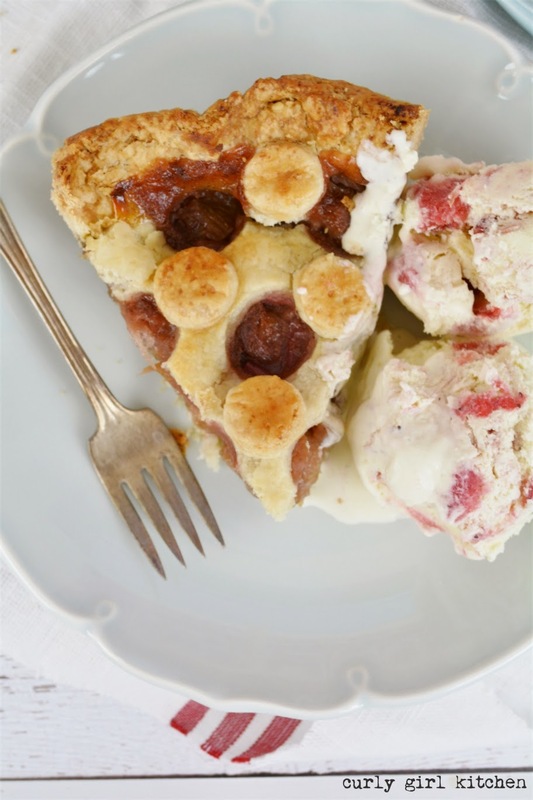 it looks delicious, and i love the way you decorated the crust! It was definitely an easy way to make the crust a little prettier! What great idea! I love the polka-dots! 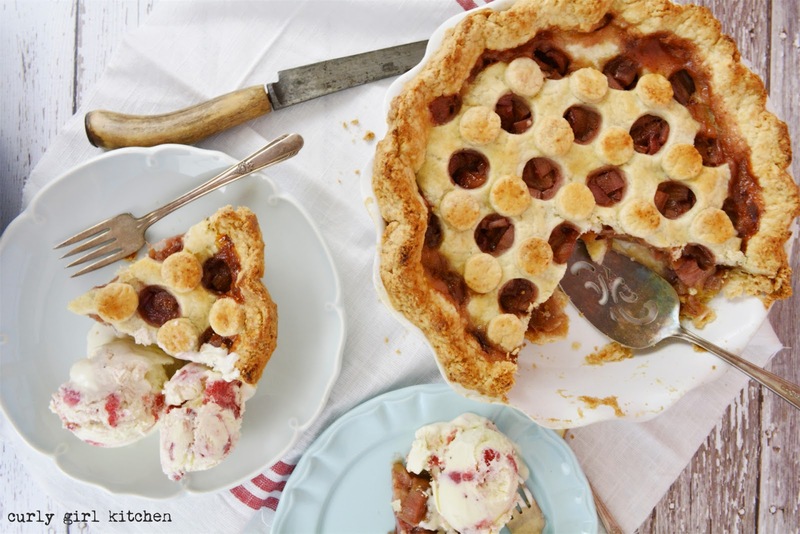 I have yet to make a rhubarb only pie but the way you spiced yours sounds so enticing! Pinned! 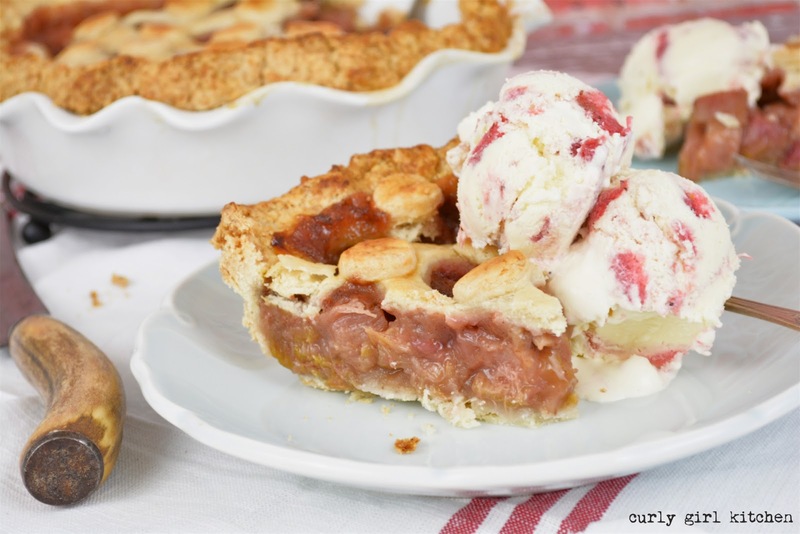 I've made other combinations before like Peach/Rhubarb or Strawberry/Rhubarb, so this is the first one I did of just rhubarb as well. I love the tartness of it!